Another month has come and gone, which means it's time to look back at my monthly goals! Summer months seem to fly by, so I made sure to not give myself too many goals. Here's how they turned out for me! - Follow new half marathon training plan. Yes! I did miss one easy run because I needed an extra rest day (right now, my plan only gives me one rest day a week) but I have followed it to a T besides that. You can follow my Towpath Half Marathon training here! I also hit an exciting milestone- my first month over 100 miles (officially 111)! I finally did it guys! - Go on a long bike ride. Yes. I went on a bike ride of 5 miles early in the month. I would still like to go on even longer rides to get more comfortable, but I'm happy with my progress! - Drink more water. Yes! I realized that water was getting boring for me which is why I stopped drinking as much. I decided to buy some flavoring to put in my water, and my favorite is the Crystal Light Blackberry Lemonade. SO good! - Write a Costa Rica or Europe post. Yes! 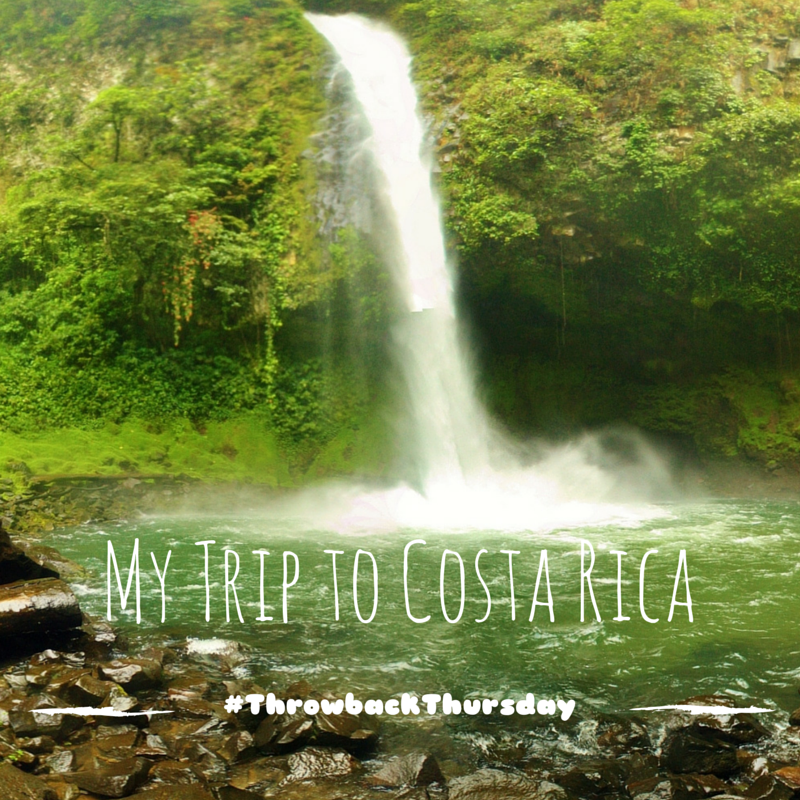 Check out my Costa Rica post here! - Pack a lunch every day. No. I was great at this in the beginning and end of the month, but the middle was a disaster. If you want to see some of my lunch ideas check out this post! Not a bad month at all. In September, I have really different goals for myself. It should be a fun and interesting month! - Start swimming. I bought some goggles, now I just need an (appropriate) swimsuit and start doing laps at my gym! I have to admit I'm really intimidated and nervous since I've never been a lap swimmer. If anyone has experience and can give me advice on starting out I would really appreciate it! - Go for a hike with Dan and Selma. Fall in Pittsburgh is gorgeous, and I want to take advantage of the (hopefully) cooler weather with more hikes! I would also love suggestions on hikes around Pittsburgh! - Cook Caribbean food. Last month I took the month off my International cooking challenge, but this month I'll be attempting Caribbean food! I'm looking forward to it. - Hang all of my paintings and other photos. Dan and I have lived in our current apartment for a year now, and I still haven't hung up our pictures. Time to finally get this done and add some color to our white walls! - Cross Train two times per week. I've been really bad about cross training this summer, so it's time to get back into it. There you have it! Not my typical goals for the month, but it should be fun to mix it up for the fall. I love how organized and ambitious you are with your goals this month! I think mine is just to survive because September is going to be BUSY. I also love those water flavoring things (I drank the Lipton Iced Tea ones a lot this summer!) and don't want to think about whether they are worse for me than soda or not. Eek! That's a great goal! I should probably do that as well when I change my wardrobe for fall. Good luck!! you did really great in August! I totally failed on the eating out thing as well. I swam for a few months (bought my swimsuit at TJ Maxx lol) and my husband taught me and it was good, just not for me. Do you follow Tracy @ A Change of Pace? I'm sure she'd have tons of info for you. I love the idea of cooking international food! Great job with your August, and I love that infographic! Very cool to see the types of runs you did, and woot - over 100 miles in one month is huge! Good luck with September's goals - I know I need to cross train more, maybe now that we're in a new month I'll take it more seriously! Thanks Janelle! Good luck with cross training..it's always hard to incorporate but helps out so much! My goal is to get back into running on the regular! I have really ditched it for biking this summer; it's just been so hot, but I'm up a few pounds and I know it's because all my long bike rides end at the Hofbrauhaus or one of the craft breweries in Millvale. Hahaha!! Good luck with increasing your bike milage and avoiding beer stops, which seems to be my problem! ;) In all seriousness, I'm really looking forward to the cooler weather that I enjoy running in. That's a great goal! I would love to have that problem of biking to too many breweries..sounds like a good way to live :) I can barely drive sober though, so maybe drinking and driving isn't smart for me lol! 100 miles, Congratulations! That is a big accomplishment. I love that you do monthly goals. I love the "fresh start" feeling of every new month. My goals are to start going to weekly prenatal yoga classes and to start going to church regularly. I love monthly goals! It's so much better for me to have a fresh start and new goals each month rather than waiting till January. Definitely keeps me on track! Thank you! I'll have to check out that recipe. How cool that you lived in Trinidad! Love it all, Gretchen! I always did my laps in my bikini as I have a super freaky long torso and none of the one pieces fit me properly. Ha ha! I was a terrible swimmer anyway and I only did it while I was pregnant. I have a really short torso so I'm hoping the one piece I ordered fits! (I just put in the order yesterday!!) I'm worried those old birds who swim all the time will lap me and say mean things to me lol! I pack my lunch all the time. Parking can be a disaster in the middle of the day so I don't want to chance it. We're quite limited with what's available on campus and Subway is usually the only healthy option I see. I guess that's a good and bad thing about working downtown..so many options for food! There are probably close to 100 places I can walk to during lunch. Makes it way too easy to "forget" to pack but also expensive! You're running Towpath? Fun! I've often considered it but have never done it. Maybe that will change. Congrats on your first month over 100! I'm really excited to run it! I've heard really good things about it so I can't wait. Thanks Rachel! That's a great goal! I bet it will help with moving to a new city. Definitely will get you out and exploring! I think you did, but I can always use another compliment ;) Thanks Meredith!! Yay for your new monthly mileage PR! Great job on August goals. Here's to an awesome September! Love your monthly goal posts. Always a great reminder for me to set some smaller monthly goals & see idea other people have. Let's see, lap swimming, Pinterest has a TON of great swim workouts you can find. I would say go for something with short intervals if you haven't swum much in a while. 50-100 meters with 30sec-1minute rest in between. Do 4-8 of those as a set, depending which length you pick, sandwich that between a warmup & cool down, plus some kicking with a kickboard if you've got extra time. You can add on more distance as you get faster/more comfortable. In terms of hiking...I love McConnells Mills, and Raccoon Creek State Park. McConnells Mills is some great easier hiking depending on the paths you pick and mostly follow the water which I love. It's not far from North Country Brewing which is a restaurant/brewery in Slippery Rock. Great food, atmosphere & beer. You can't beat that. If you have any great hiking spots in PGH, please share. I tend to repeat my favorites over & over. My goals are to spend 10 minutes stretching each week, a huge jump from the 0 minutes a week I stretch now, to ROCK my tri out at Moraine in a few weeks & to clean out the pantry/fridge before I move in a few weeks, even though that will mean some WEIRD meals. Thanks so much Jessie! you always have the best suggestions..I really appreciate it :) I'll definitely try out that workout, and will check out those hikes! Have a great month and good luck your tri!!! OOO I hope you share about your Caribbean cooking adventures!! I'm still bad about packing lunch...almost ready to accept it. My goal is to definitely pack a lunch every day! I get so lazy!